The Alaska Zoo has been at the center of ‘Where the Wild Things Are’ in Anchorage for the past 49 years, a tradition of service that makes zoo staff and volunteers proud to take part in. The zoo recently received the honor of being nominated for the All Alaskan Award by Visit Anchorage as part of the 39th year of the Seymour Awards. We were nominated alongside 34 other worthy organizations, all working to provide support and service to Alaskans and visitors alike. On the evening of April 6th, we found out that the Alaska Zoo was chosen as the winner of the 2018 All Alaskan Award! 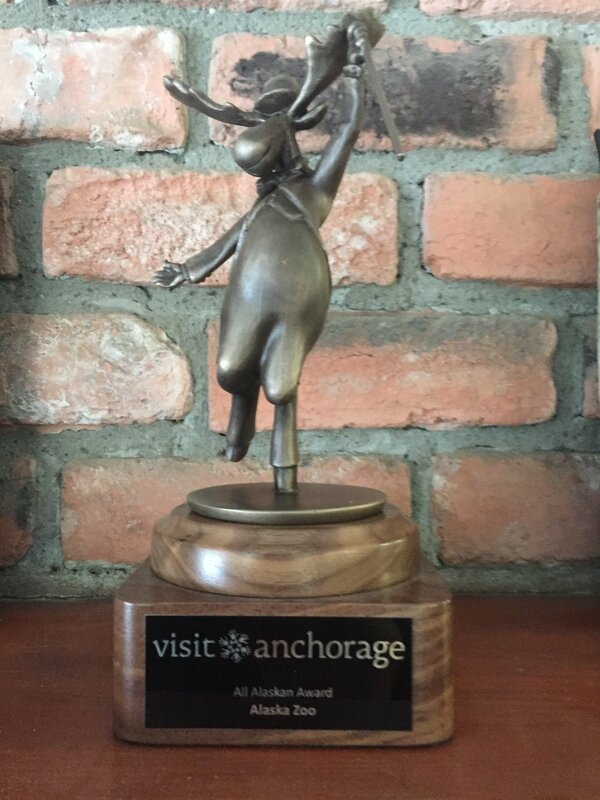 This award was given to the zoo in honor of outstanding contributions made to Visit Anchorage, the tourism industry and community. We were chosen for this award out of nearly 1,000 member businesses, a true honor indeed. At the event, Alaska Zoo Executive Director Patrick Lampi was on hand to receive the award and a poem was read, written by Sonya Wellman, Events Manager with the Rasmuson Foundation. We wanted to share this poem and express the gratitude we feel for our community here in Anchorage, as well as across Alaska and around the world. We would not be the organization we are today without the continued support of visitors and donors. We thank Visit Anchorage and our peers for this nomination and award. And we thank you, the loyal zoo visitors. The loyal donors and partners. The embracing tourists who travel so far to catch a glimpse of a wild Alaska which we are so fortunate to have in our own backyards in Anchorage. We are grateful for all of the support we receive to continue our mission of care for wildlife in need. Here in the land of where the wild things are. A mainstay here in the land of the midnight sun. Conserve the species of the Arctic you say? Education all the live-long day! Fundamental to their mission here in Anchor-Town. Wonderful experiences for visitors and locals out and about.